This one-and-half story Craftsman has a square plan, broad low side-gable roof, wide eaves with heavy triangular knee braces, and coursed shingle cladding. The symmetrical facade is dominated by a full width wood porch under the extended eaves supported by brick piers and hip wall. The slightly projecting entry has an original door with beveled divided lights and plain sidelights. The windows on each side of the entry are a grouping of wide sash flanked by narrower wood sash all with patterned divided lights over a single pane. The north elevation features two large hanging bowed window bays with four vertical sashes of similar pattern. Other windows are similar original wood sash in pairs and groups. The house sits slightly above the street on a large corner lot with a low rockery, lawn, foundation shrubs and several mature oak trees in the parking strips on the north and east sides. 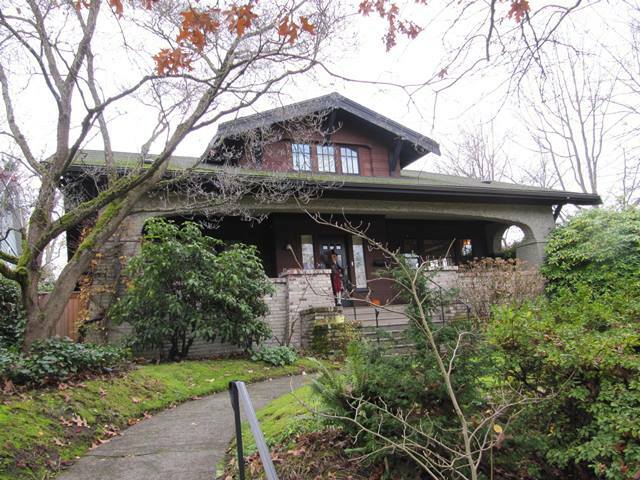 The detached garage (1912) has compatible wood panel doors with divided lights in the upper third and a deck with newer wood railing and balustrade above; it in the northwest corner of the lot, accessible from E McGraw St.